Here’s just a handful of the Seeed Studio people we have known for years. 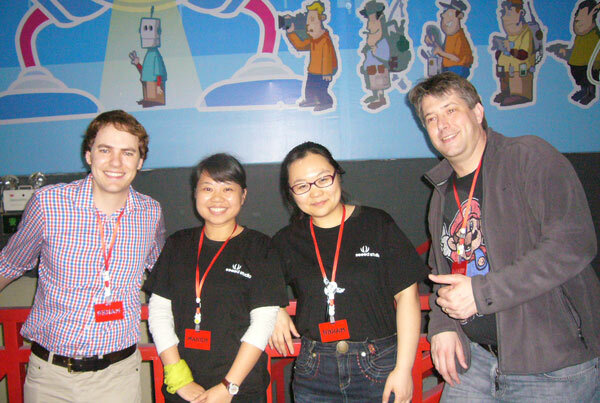 Many we’ve met at Maker Faires in the US, many we just met for the first time in China. Kevin has been doing our test engineering for nearly two years. He makes sure your Dangerous Prototypes are working when they leave Seeed, and he saved they day by finding an ATX power supply for our Maker Faire table. Kevin is a great guy. More of our Seeed friends below the fold. 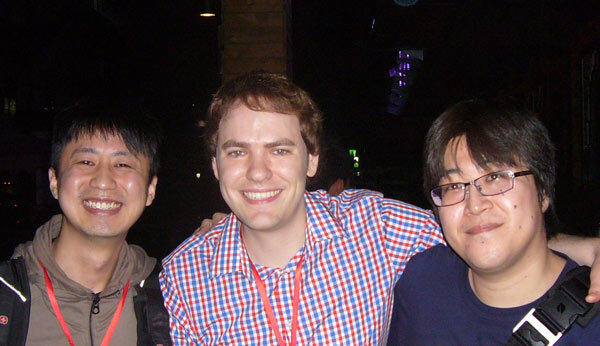 Liao, Ian, Yoshi. 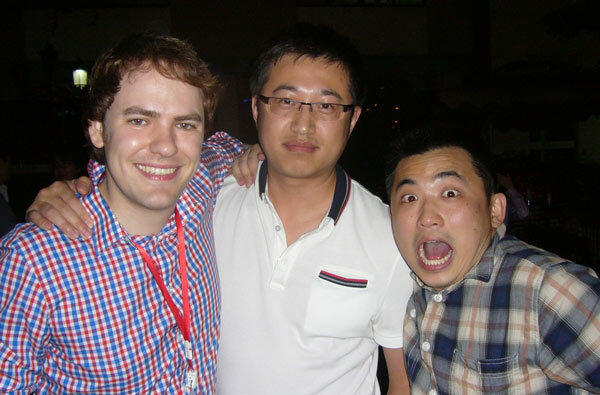 Liao has been with Seeed from the beginning. He told us that he and Eric used to bring parts back from the market on the bus because they couldn’t afford a taxi. Often the bus was full and they had to wait in the sun for an empty one. They’ve come a long way in three years. Yoshi is an awesome maker and open source hacker from Japan. 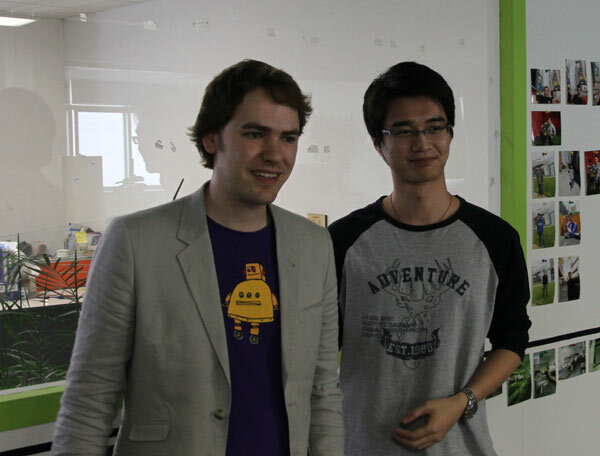 We met him at Maker Meeting in Tokyo, and we were so glad to see him again in China. He’s currently trekking across the US, visiting major open source landmarks and hackerspaces along the way. Ian, Hao. Hao is Seeed Studio’s marketing director, and a super great guy. He drives a one year old car that still smells new – that’s some marketing! Ian, Heidi, Nana, Sjaak. Heidi and Nana are project managers at Seeed Studio. They have the arduous task of finding the parts for our designs and making a quote. After that, they have to make sure it gets through manufacturing. Sjaak is part of the DP crew, you’ll find him in the forum and occasionally the blog. These are just the people we managed to get pictures with. Seeed has over 70 employees working super hard on project design, manufacturing, and fulfillment. Everyone was extremely friendly and helpful, and we plan to go back every few months to help get our newest projects into production. A huge thanks to everyone at Seeed Studio for making us feel so welcome! This entry was posted on Wednesday, April 18th, 2012 at 2:00 pm	and is filed under Global Geek, manufacturing. You can follow any responses to this entry through the RSS 2.0 feed. You can skip to the end and leave a response. Pinging is currently not allowed. I’ve been aware of Seeed for a while, though, I have yet to buy from them… I’m not sure why. Thanks for bringing the human element to their company, I am very impressed. Did you met PENG SHIQIAO? I always see this name in Seeed’s boxes. I would have liked to see one picture of the outside of the building, and one of Itead as well, aren’t they just across the street? I’m sorry, we didn’t get any pictures of footage of the outside, I’ll be sure to get some the next time I’m there. It’s a pretty standard looking industrial estate with parking lot and 7-8 floor buildings. Shenzhen is nearly twice as big as New York, so I think it is unlikely that they are right next to each other. I tried to find an address for Itead and google map it, but I didn’t find one on the site. By road, they are about 17 km from each other. Thanks for the reply, I don’t know where I got the Idea they were more closely associated, I think it was from someone’s forum posting. I had the notion that the principle owners of the two companies once worked together and then split to become competitors. Anyway good to know. If seeed now offers to laser cut solder paste stencils with their board service it would interest many here to see how they compare to Iteads chemical etch stencils. Seeed should be cheaper (and plastic) – better for the hobbyist. I was going to order boards made by Itead but cheap laser cut stencils would make me switch. I thought Seeed were doing Stainless stencils? Maybe I’m getting mixed up with Itead? ITead is for sure. Seeed told me they have a high demand too, and may start shipping them as well. OK, thanks, that would be good if they do.